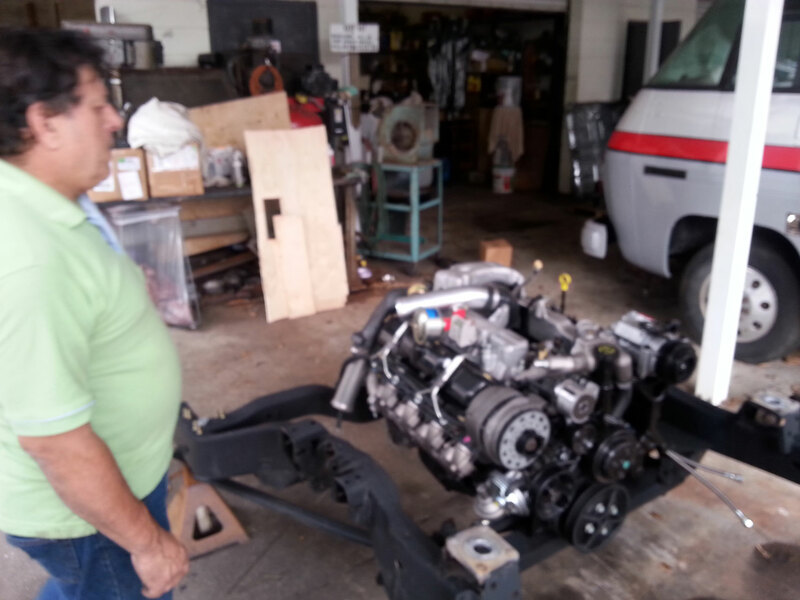 Manny & Hank have been working on the install and Manny feels good the the motor will fit . 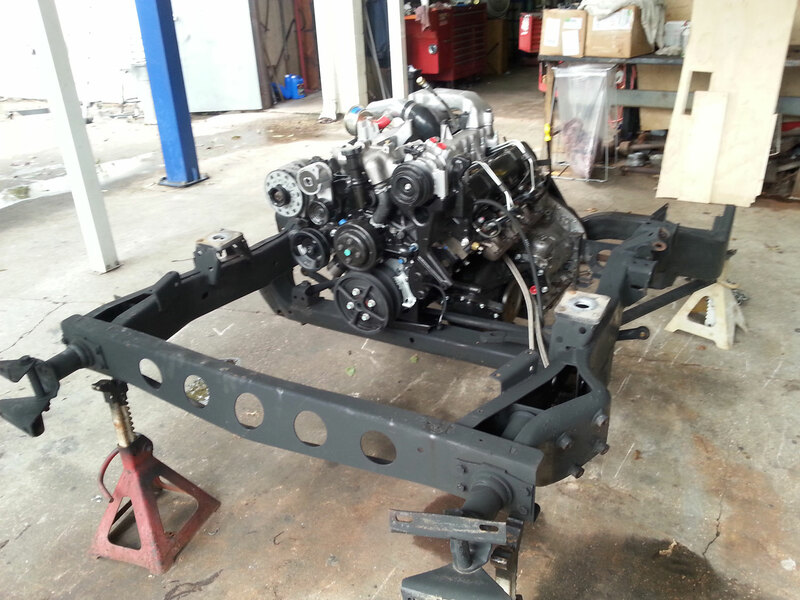 No wait… we want the motor in there man!! OK, that’s better It’s hard to catch a pic of Manny, he keeps ducking out of the way… he just keeps saying you and your pictures…. Hey, Inquiring minds wanna know! . Let me take a little time to give you the parameters of this project. 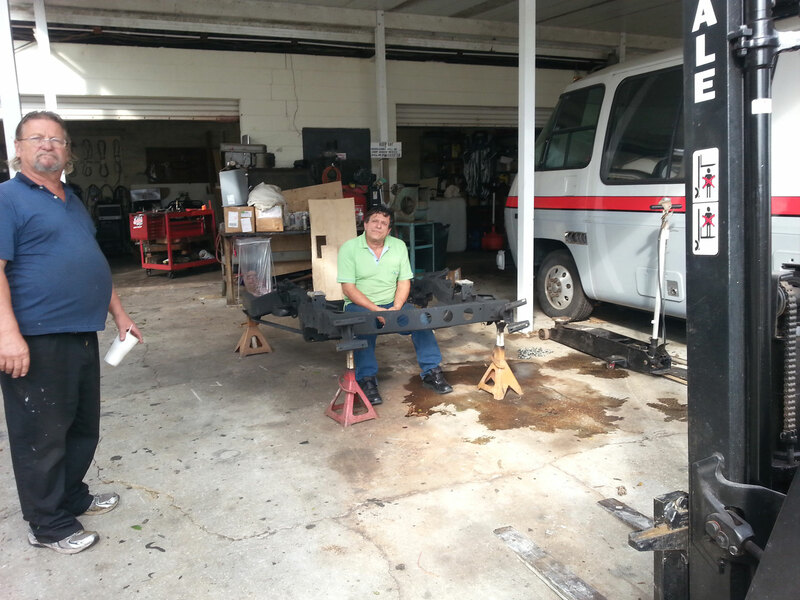 As you may know, Manny has been working with the folks who produce replacement crate motors for the military Hum V vehicles. These maches were built to a military spec. requiring them to operate in some pretty harsh invironments. How bout after a Neutron Bomb takes out all the electronics throughout the world? There are no electronics on the motor! Yep, nothing…. this is a turbo charged, mechanically injected diesel designed to work in combat conditions. Manny has devised a way to mate our original front wheel drive transmissions without an adaptor plate which is a big no-no when talking torque. The has custom designed an oil pan that makes thise diesel do what few other motors can do… mate up to our front wheel drive configuration. Now this is not a conventional “motor swap” as all of us may have done in our back yard. I’ve done that and what always happens is interfacing a new different motor into a vehicle you have issues. This project and installing one of these diesels will not have that. Every one of these swaps will be done “on the ground” off the coach. 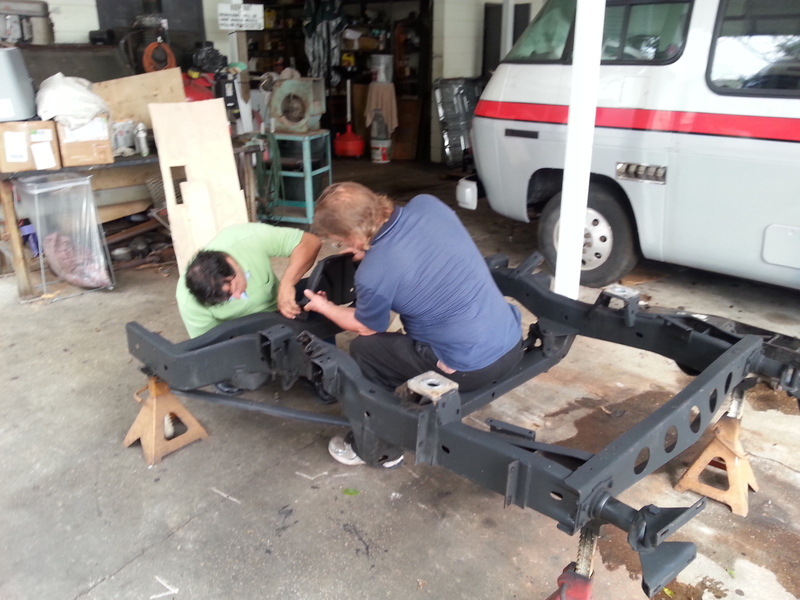 The front clip will be completely assembled WITH the rest of the drive on the ground and then seved up into the coach. All components will be removed, cleaned, inspected then assembled on a fresh chassis clip. We will essentially be turning ALL the clocks back to 0. All parts will be assembled all at the same time. This will assure no fitment issues to make this drive train truly be reliable! So it begins, Manny is in the house and will be here through Thursday… yes, this is such an important thing he has given us his holiday time from Deo and his family to make this happen… what a man! And what a project! Actually, this project will go to help us all in that our goal is to document labor and the processes needed to install the motor into the clip and to the rest of the drive train. We will end up running the drive train on the ground BEFORE it goes up into the coach. Yes, this will be an extreme refit, it will not be “cheap”, that is not the goal, the goal is to offer up a completely reliable drive train to take our classic motorhome into the future in viable operation. How much? There have been numbers thrown out over the past year… all are wrong because they did not include the extent of “new” this drive train will be. 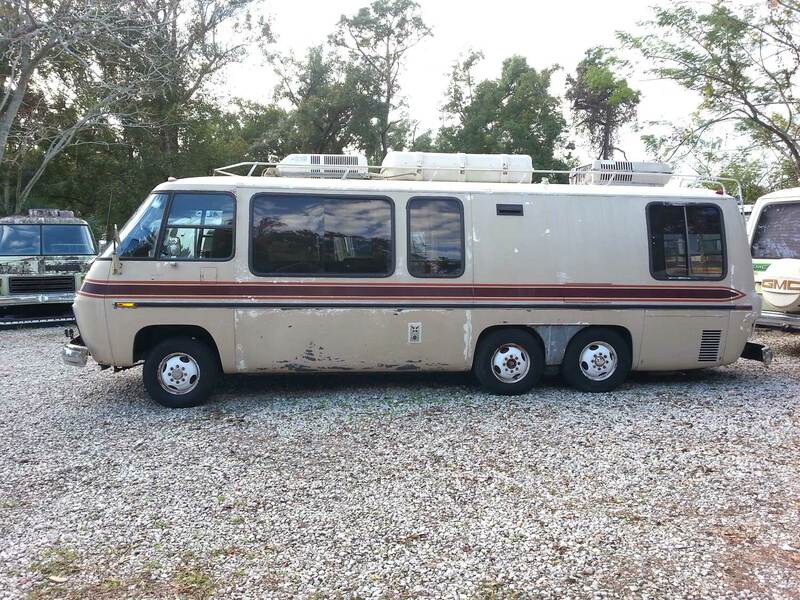 There will be no cheap way out… only the best way to a quality GMC on the road doing your wishes and being the dream coach you knew it could be. Something like that will take time, it will take a pile of parts… work and more parts. It will be complete and for many it may not be an option that fits your budget, for others it will. I’m not bailing on our gas powered original drive train but there are levels of reliability that an original drive train simply cannot obtain and THATS what this is all about. Don’t miss any of this it’s out future. OK, gotta go, big day for the Co-op, we’re marchinf 18 years of stuff 100 yards to our new digs… don’t ya wanna help us? Hey John D. came this weekend.. camped in the shop and we had a great time. Pics tomorrow on that…… see ya later…..